Professor Chinchilla is Masters in Business Administration, ESAN, Peru. He has doctoral studies in Strategic Business Administration (DBA), Maastricht School of Management, The Netherlands and Pontificia Universidad Catolica del Peru. Public Accountant, Pontificia Universidad Catolica del Peru. Bachelor of Administrative Sciences, Pontificia Universidad Catolica del Peru. 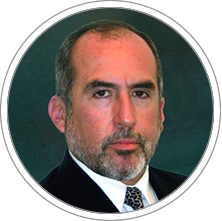 In relation to his professional experience, he has been a partner at PricewaterhouseCoopers, where he developed a career of 25 years, both in Peru, United States of America and the Dominican Republic, with specialist financial statement audit, control systems, risk management and accounting and financial aspects. His experience involves multinational companies and financial sector entities on issues such as adoption of appropriate accounting practices; preparation of financial statements in accordance with US GAAP, IAS, IFRS; for consolidation reporting issues, advice on mergers, acquisitions and the issuance of securities in the international market; and issues related to risk management. Currently he is Corporate Accounting Manager Gloria Group. Member of the Tax Committee CONFIEP and Academic Area Professor of Finance, Accounting and Economics at CENTRUM Catolica Graduate Business School. He has been reelected for a period of three years as a member of the International Oversight Advisory Committee of the International Labour Office ( International Labour Organization ) based in Geneva.